As low as $8 for Portable, Stylish Ballet Flats w/ Matching Bag! $20 Value! Today at Eversave, you can get stylish, practical & portable ballet flats with a matching carrying bag for as low as $8! The deal is being sold for $10, but if you're a new Eversave shopper, you'll get an instant $2 in credit when you sign up, making the deal only $8! You'll get an instant code to use to place your order...no waiting around to redeem a voucher! NOTE: New members must click this link to receive credit! 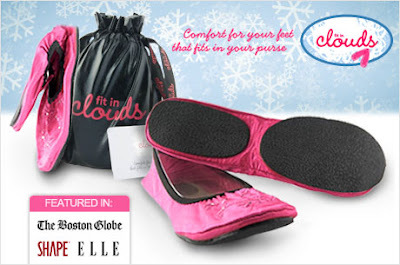 Dance your way through all those holiday parties with portable, foldable ballet flats from Fit in Clouds. They make perfect stocking stuffers for the woman in your life who appreciates style AND comfort. The next best thing to slippers, Fit in Clouds flats are chic enough to complement even the most formal gown. Whether you’re dancing the night away, dining with friends, or hailing a taxi after the party, they’ll be your comfy companion. Each pair comes with a matching drawstring pouch for elegant portability and easy gifting. I checked out the shoe site and there's 4 pairs of flats that are $19.95 that you could use your entire credit on, or use it for a more expensive pair. Prices go up to $24.95. Shipping isn't included, but it's a low flat rate of $3. You're voucher code can be used towards shipping.